Geeksphone announces Revolution, its new phone. 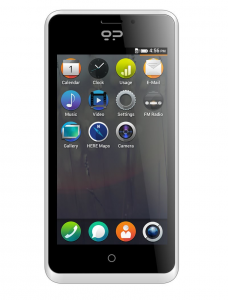 Geeksphone announces Revolution, the new phone with Android and Firefox OS. It’s the first time that a device like this reaches the market, and this one will be a high-end handset. “Once again we will revolutionize the world of mobile network. We are also confident that we will surprise everyone by its very high performance and it’s very competitively priced”. The idea is that it will run either Android or Firefox OS. In principle, the device can be ordered with Android operating system or Mozilla, but advanced users will also be able to install Mozilla’s mobile operating system as a ROM on the Android build. The company has finally renounced to the fabrication of Peak+, an evolution of its original Peak. The reason is related with some inner problems of Chinese manufacturer company which didn’t provide the supplies required. The Peak Firefox OS went on sale in April, and three months later, the company announced the Peak+ and the removal of the previous Peak. Currently, people are encouraged now to pre-order the new Revolution, which is offered at the same price the Peak ($149). However, the company indicates that this was half the price the Revolution will have. Those of you who pre-ordered the Peak+ can now get all your money back, get $20 back and receive the lower-specs Peak instead. Or you can also wait for the Revolution. It seems a branding issue may also be at play here. Geeksphone tells me only manufacturers “associated with carriers” get to use the Firefox OS name, so Geeksphone is actually using the old Boot2Gecko project name instead. This probably explains the semi-pivot back to Android.